The Maelstrom Regen MMR-X arrives in a clear presentation package, with the light completely visible as if it were in a display case. Accessories and other less interesting items are hidden away in the top portion of the package. And speaking of accessories, the MMR-X comes with a ton of them. Some you would expect, such as the lanyard, nylon holster, spare switch boot, AC wall charger (1000mA), micro-USB cable and of course the battery. 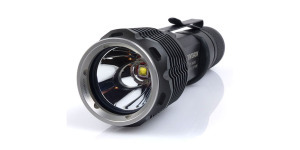 However, to allow owners to further customize their lights, FOURSEVENS also includes a plain black aluminum bezel ring along with a complete reverse click style switch and low profile switch boot for those who prefer that type of operation. Overall the MMR-X has a very clean design with minimal markings. The light itself is constructed of aircraft-grade aluminum with a hard-anodized black finish and comes with the stainless steel strike bezel already installed. The head features machined flat areas to make the MMR-X more resistant to rolling on flat surfaces. Knurling on the body and tailcap provides extra grip. The tailcap is slightly larger than the body which improves stability when held in a cigar style grip. A forward momentary switch (press for momentary, click for constant-on) is installed by default and extends beyond the tailcap. The standard switch can be replaced with the included reverse click-type switch (press and click for on, press to change modes, and press and click for off). The reverse click switch has a lower profile than the forward momentary switch and, if installed, will allow the MMR-X to tailstand. Removing the tailcap exposes the rechargeable battery which is supported between a spring in the tailcap and dual springs at the head. Tailcap threads are non-anodized and there is no lockout function for the tailcap switch. The proprietary 2600 mAh FOURSEVENS battery has dual contacts at the head allowing it to work with the MMR-X internal charging circuitry. Spare batteries are available from FOURSEVENS for $15. The dual springs in the battery compartment are used to make contact with the two terminals on the FOURSEVENS battery. A standard 18650 battery may also be used to power the MMR-X. Before installation, the plastic insulating disc must be unscrewed from the tailcap using a pair of needle-nose or snap-ring pliers inserted into two holes. The insulating disc is then placed into the battery tube so that it prevents the outer spring from contacting the positive terminal of the standard 18650 battery. The LED indicator turns red while charging the FOURSEVENS battery and then turns green when charging is complete. A full charge took about 4 hours 40 minutes with the included AC adapter. 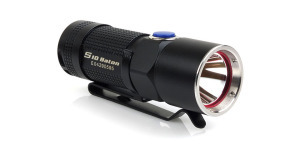 At the front, the Cree XM-L2 emitter is housed behind a sapphire coated anti-reflective glass lens. Output is focused by a smooth reflector. The stainless steel strike bezel may be removed with firm hand pressure allowing it to be swapped with the included flat black aluminum version. The black bezel ring provides an alternative for those who want a more stealthy appearance or where a crenelated strike bezel may not be appropriate (or allowed). The included nylon holster fits the MMR-X well and offers good protection for the light. A Velcro closure on the front flap keeps the light secure while a fixed loop and D-ring on the back provide means of attachment to a belt or pack. The paracord lanyard measures 18″ long and uses a swivel gate clip and split ring to attach to the tailcap. Users may configure the MMR-X to use any one of five different mode groups containing from 1 to 8 operating modes. For groups 2 through 5, the output modes are advanced with the tailcap switch while the light is on. With the forward momentary switch, turning the light off and back on again within 2 seconds will advance to the next mode while the reverse click-type switch requires a press (but no click) and release. The MMR-X has last mode memory which is set after the light has been on for at least 4 seconds in one mode. If the MMR-X is off for at least 2 seconds, the next time it is turned on, it will return to this memorized mode. When the output mode is changed, the MMR-X will return to the first level in the mode group and can then be advanced through the rest of the modes. To select a different mode group, the MMR-X must first have the FOURSEVENS battery installed and be connected to a USB power source (AC adapter or computer). Once the charging indicator is lit, pressing the tailcap switch will cause the MMR-X to flash in low mode with the number of flashes corresponding to the current mode group (1 through 5). Cycling the light off and back on again will advance the light to the next mode group in sequence. The selected mode group is locked in by either turning the light off or by unplugging the USB cable. The MMR-X may be used while charging by activating the tailcap switch and waiting for it to flash the mode group number 10 times, after which the light will then switch to its memorized mode. If the mode group has been changed, the MMR-X will output the first mode of the new group. 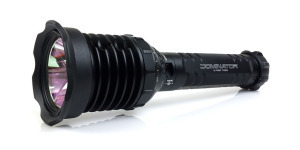 The Cree XM-L2 emitter and smooth reflector combine to produce a beam with a clearly defined center hotspot with a creamy white tint and a large corona with a green tinge. The remainder of the spill beam is cool tinted and cuts off abruptly at the edges, as with most reflector based lights. The output modes are well spaced with an easily visible difference between each of them. When used in Max mode, the MMR-X provides solid illumination out to 80 yards and can reach much farther with reduced intensity. A runtime test was conducted using the provided FOURSEVENS lithium-ion rechargeable battery. As advertised, the MMR-X produces its initial burst of output for around 1 minute before beginning to step down over the course of the next minute. This level of output was well regulated for the next 1 hour 45 minutes followed by around 50 minutes of declining output as the battery was depleted. In my testing the MMR-X stepped down to around two-thirds (67%) of its initial output rather than the 50% shown on the manufacturer’s specifications. The drop was gradual enough that it is hard to detect when using the light although it is noticeable when comparing side-by-side beamshots. The Regen MMR-X is a solid performer and has worked flawlessly during the review. All finished surface are free from defects and the anodizing appears to be very even and applied well. The markings, what few there are, are very legible and, speaking for myself, I appreciate the minimal amount of engraved text on the light. With its built-in charging capability, the MMR-X makes the task of recharging the included battery much easier and should make the light more attractive to those who aren’t accustomed to working with the types of equipment needed to charge lithium-ion batteries in external chargers. Nearly everyone already has one or more electronic devices that charge via USB so the MMR-X should provide a very brief learning curve. In the event the charging cable is lost or damaged, the fact that it follows the non-proprietary micro-USB format means a replacement can be easily obtained. The included 2600mAh lithium-ion battery has good capacity and should be more than adequate for most users but spare batteries are reasonably priced at $15 for those who need more. Also, the ability to use standard 18650 batteries provides another option for extended operation. This functionality and the inclusion of the plastic insulating disc is a nice touch, although the disc may be difficult to remove without the appropriate tool. With the selectable mode groups the MMR-X allows users to choose which combination of output modes best suits their needs. Programming is simple and straightforward although it can’t be performed “on the fly” due to the need to have the FOURSEVENS battery installed and the light connected via the charging cable. Mode changing worked well with both switches with my personal preference being in favor of the default set-up with the forward momentary switch and the MMR-X configured in mode group 2 (Max – Low). The reverse click-type switch is more convenient to use with the mode groups that offer several output levels. Perhaps one of the most impressive things about the MMX-R is its diminutive size which has to be near the lower limit for an 18650 powered light with internal battery charging. This fact is made even more evident when the MMR-X is compared to the other built-in rechargeable lights used in the beamshot comparisons. It would be ideal for pocket carry if a pocket clip were made available. I originally had some reservations about the design of the proprietary FOURSEVENS battery as there is no insulator between the positive and negative terminals at the head. I felt confident this would not cause any problems while the battery was installed in the MMR-X but I was concerned the terminals could be shorted accidentally if the battery were outside the light, for example when carried in a pocket as a spare. FOURSEVENS responded to my concern and pointed out that the proprietary battery uses a very robust circuit to protect itself from short circuiting (over-current), as well as over-voltage and under-voltage conditions. With their encouragement I tested this myself and could not cause a short circuit using coins, a gum wrapper, a keyring or any other items typically carried in a pocket. The protective circuitry worked as advertised. When powering the MMR-X with a standard 18650, users must always install the plastic insulating disc to eliminate the possibility of the negative contact spring (the outer spring inside the light body) coming in contact with the positive terminal of the battery. Users who may want to use this functionality will need to make sure they have an appropriate tool for unscrewing the insulating disc from the tailcap or simply leave it loose in the tailcap. 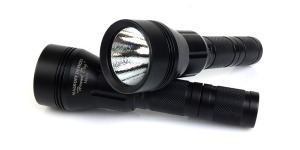 The MMR-X has a lot going for it with its combination of output, built-in recharging capability, configuration options, and price which provides something for everyone, from the flashlight novice to a seasoned flashaholic. 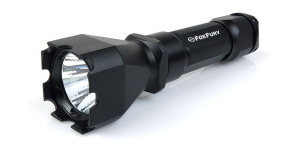 Anyone in the market for a solid rechargeable flashlight should give this one a long look. An option for a pocket clip would be nice. Follow FlashlightGuide on Facebook and Twitter to stay up to date on the latest flashlight news, reviews and information. Additional information about the Maelstrom Regen MMR-X can be found on the FOURSEVENS website. The MMR-X was designed by FOURSEVENS in Atlanta GA, USA and assembled in China with components from USA, China and Malaysia. 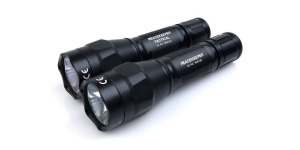 Posted in Flashlight Reviews, Other Products and tagged LED Flashlight Reviews, Rechargeable Flashlights.